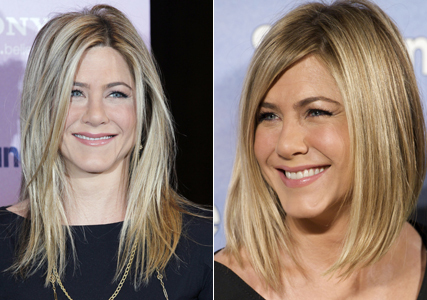 Jennifer Aniston's new bob: Love or hate? Jennifer Aniston’s new bob: Love or hate? The leading lady has chopped her famous locks into a chin-grazing bob, but what are your thoughts? Thanks to that Rachel cut, Jennifer Aniston’s hair has long been one of the most scrutinised barnets in Hollywood, so when she chops off a couple of inches, it’s big news! Ms A revealed a new sleek bob as she promoted new movie, Just Go With It, in Madrid, just a night after stepping out at the Berlin premiere with her mane its typical below-the-shoulder length. The chin-grazing style is the shortest the actress has dared to cut her locks since 2000, when she opted for a similar style. Since then she’s never strayed far from her signature honey-hued shade and longer length. WATCH the trailer for Just Go With It below….